Jo’s paintings are freely executed, with lyrical mark making and vibrant colours often enhanced by strong tonal contrasts. Green hues unify her compositions, with seasonal differences clearly evident. Close viewpoints with clearly recognizable plants and structures capture the essence of the garden, helping the viewer feel enclosed in a beautiful place. Glimpses of vistas beyond create the illusion of space and suggest the vastness of the gardens. All paintings are completed ‘en plein air’, so that her responses are much more than a photographic record, but a fusion of all senses. They are a joyous celebration of nature and the restorative power of gardens and gardening. Jo Reitze grew up in Ballarat with her mother and twin brother after the passing of her father. Her third grade primary school teacher, recognized Australian Potter, John Gilbert, displayed many of his modernist paintings on the mantle above the blackboard in classrooms. It was this early exposure that fostered Jo’s love of art, which was continued in secondary school. Her art teacher saw promise in her bold, expressive work, encouraging her to develop her free individual style. It was Jo Reitze’s Aunt, Phyl, who encouraged her passion for gardening, often taking her around her own garden and selecting flowers for her to take home. With this love of art and gardening, Jo’s passions began to merge. In 1972 Jo completed a four year Secondary Art and Craft Teaching Course at Kay House, Melbourne Teachers College. Her first teaching appointment was at Bacchus Marsh High School, a small rural town approximately halfway between Ballarat and Melbourne. Despite winning several awards for best local artist at the Bacchus Marsh Annual Art Show, Jo decided she could not live on her ‘College laurels’ forever, setting herself the goal of completing at least twelve paintings a year while teaching full time. While Jo Reitze mostly painted still life and figures at College, after graduating she initially turned to landscapes and seascapes, painting three particular locations at coastal Ocean Grove on school holidays. In 2009, Jo was selected to exhibit at Geelong Gallery in their Shell Regional Artist’s Programme. Her exhibition ‘Sea Air’ featured a selection of recent Ocean Grove paintings of those same locations. Jo Reitze is also a Fellow of The Victorian Artist’s Society and is President and Bulletin Editor of Melbourne Society of Women Painters and Sculptors. She coordinated Art at Canterbury Girls’ Secondary College for twenty years. Though Jo retired in 2005, she continued to teach part time for another two years, her last group of students being able to complete their VCE. 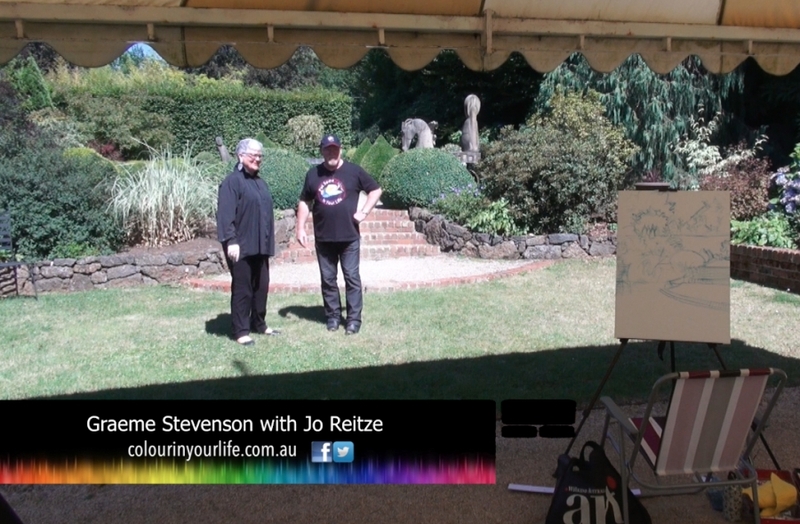 That same year, Jo began ‘Jo Reitze Paints Your Garden’, and has painted numerous gardens since then. Her work has given passionate gardeners great pleasure, which she finds extremely uplifting. In 2008, Jo was asked to be the artist of The Beyond the Garden Wall project, which demonstrated the significance of gardening for the well being of older people.